Beautiful enough for a display piece, yet durably made for daily use, this or any McVan Rosary makes the perfect gift for a young person on their First Holy Communion day. Guaranteed to last a lifetime, this wonderful Rosary is the absolute highest quality, and 100% Made in the USA! 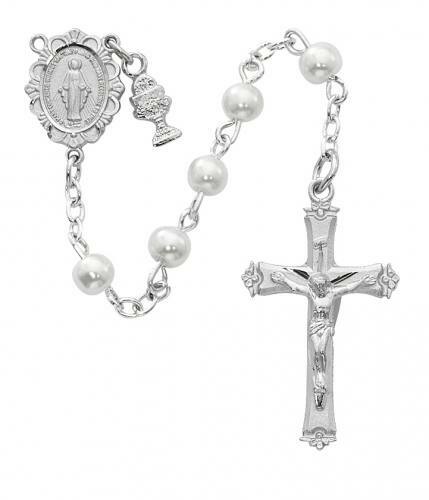 We are proud to sell McVan Rosaries, the best, highest quality Catholic Rosaries available. Proudly manufactured in America, each McVan piece comes with a Lifetime Warranty. McVan stands behind their products, and so do we! We are one of the largest McVan, Inc dealers in the nation, and are proud to sell their extensive line of high quality products to our customers. If you ever have a problem with your McVan product, all you have to do is contact us, and we will work to fix the problem! Note: the close-up picture of this McVan Rosary is meant to show the intricate detail in the crucifix and center and the fine material of the individual beads. This Rosary is a complete, five decade Catholic Rosary.